What makes them special, they’re all on sale! 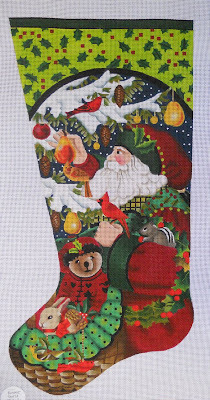 Melissa Shirley’s Forest Santa 11 1/2″ x 22″ long on 13 count canvas. 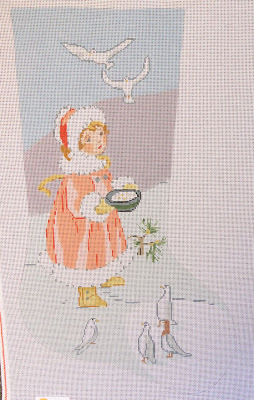 Was $279.00 now $225.00 In contrast to a snowy scene this one is warm and wonderful with many content forest animals with birds and Santa picking a golden pear. Please let me know if you’d like to have this stocking kitted with threads. As always, click on the image to see the canvas in our web store. 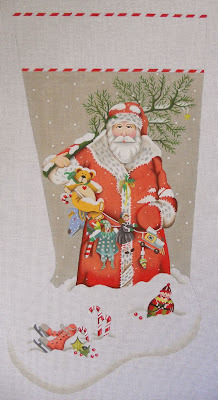 Melissa Shirley’s Decorating Santa 12″ x 23″ long on 13 count canvas. Was $339.00 now $270.00 A festive Santa perfect for girl or boy of any age. Please let me know if you’d like to have this stocking kitted with threads. 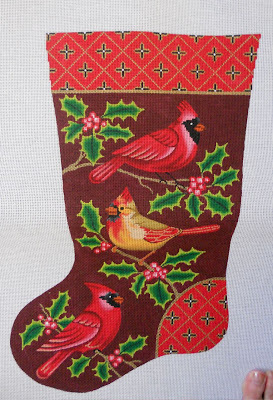 Cardinal stocking by Amanda Lawford 12 ” x 19″ long on 13 count canvas. Was $215.00 now $172.00 A handsome and festive Christmas stocking perfect for a birder, or someone who just admires birds and good design. Please let me know if you’d like to have this stocking kitted with threads. 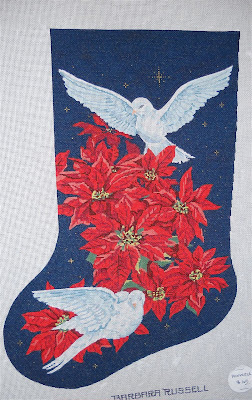 Poinsettia stocking by Barbara Russell 12 1/2″ x 18″ long on 18 count canvas. Was $165.00 now $132.00 As with all Barbara Russell Canvases this one is stitch painted making it a joy to stitch for those who prefer basketweave. I can imagine the poinsettias in red velvets with beaded centers against a sky in midnight blue silk lame braid. An elegant and timeless holiday design with modest proportions. Please let me know if you’d like to have this stocking kitted with threads. 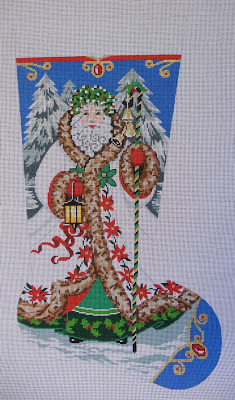 Elegant Santa by Lee Needlearts 12 3/4″ x 22″ long on 13 count canvas. Was $135.00 now $108.00 As with all Lee Canvases this one is stitch painted making it a joy to stitch for those who prefer basketweave. A feminine choice without being girlie. Please let me know if you’d like to have this stocking kitted with threads. Melissa Shirley’s Red Cottage 11 1/2″ x 22″ long on 13 count canvas. Was $279.00 now $225.00 A loving nostalgic scene of Santa and his 8 reindeer in front a full moon rising above a tiny cottage. 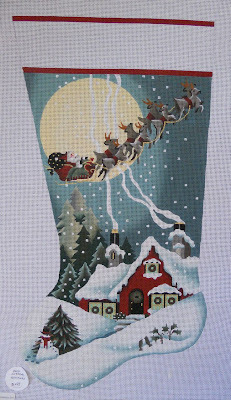 Please let me know if you’d like to have this stocking kitted with threads. 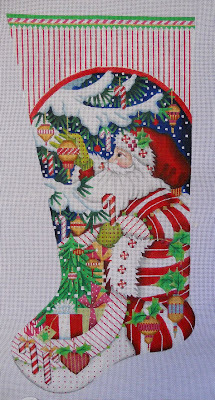 Snowy Santa by Mary Lake Thompson, for Melissa Shirley, 12″ x 23″ long on 18 count canvas. Was $308.00 now $246.00 A peaceful and more simplistic Santa with toys for all the boys and girls. A timeless design. Please let me know if you’d like to have this stocking kitted with threads. Young Girl stocking by Aviva 12 1/2″ x 22″ long on 13 count canvas. Was $135.00 now $108.00 As with all Aviva canvases this one is stitch painted making it a joy to stitch for those who prefer basketweave. What a beautiful young girl with a gentle face feeding the birds in a snowy landscape. Looks to me like she’s wearing Ugg’s but I wouldn’t keep this from giving her a lovely upscale fur trimmed coat or maybe switching to patent leather boots or kidskin boots in applique. Please let me know if you’d like to have this stocking kitted with threads.